CARF was established in 1966 and stands for Commission on Accreditation of Rehabilitation Facilities. 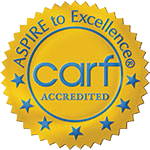 CARF is an internationally recognized accreditation authority promoting and advocating for quality rehabilitation services. Being CARF accredited is an indication that the program has successfully met nationally and internationally recognized service standards, which focus on solid business practices and quality service delivery. Achieving CARF accreditation recognizes that the provider is committed to continually improving services, encourages feedback and solidly serves the client and surrounding community.